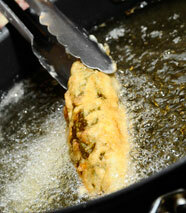 Few food ingredients are as versatile as chiles and few dishes are as versatile as chiles rellenos. I grew up loving roasted, cheese-stuffed poblanos; the kind that are rolled on wheat flour, dipped in a beaten eggs mix, fried in vegetable oil, and covered with caldillo—a light tomato sauce. It was always a treat with the implicit risk of a spicy sting as genetic uniformity among the same pepper was inconsistent back then. One of the most creative forms of Mexican cooking is stuffing chiles. The immense variety of chiles in Mexico, and the vast choice of meats, cheeses, vegetables and mushrooms available, makes this cooking option a heaven for cooks and chileheads alike. Notwithstanding the fact that the most popular chiles rellenos in Mexico are poblanos stuffed with ground beef or cheese—and chiles en nogada, a september specialty—a regional map of chiles rellenos could be easily created. Chiles güeros rellenos de camarón are popular in Jalisco. 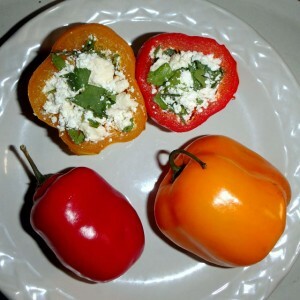 The northern states use Anaheim and poblano peppers. In the lower central part of Mexico —the Bajío region—chiles de chorro, a variety between the poblano and the Anaheim, are stuffed with ground beef, cheese or beans, battered, fried, and covered with caldillo. In Oaxaca chiles de agua and pasillas oaxaqueños—a smoked variety found only there—are the norm. 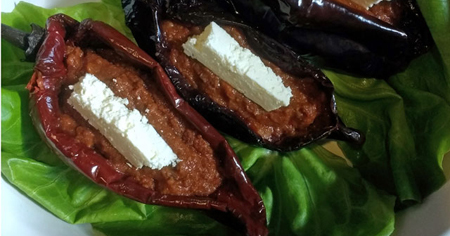 Both very hot but flavorful, they are often stuffed with vegetables aside from beef and quesillo—a typical Oaxacan cheese. In the Tehuantepec Isthmus chipotles are stuffed with plantain, potatoes, pineapple, raisins and nuts. They are a real treat. 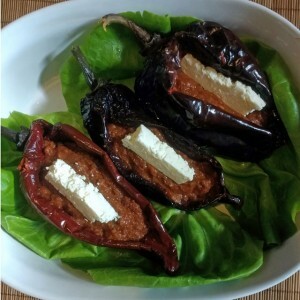 In the Fall Puebla offers the famous chiles en nogada, but year round ancho and pasilla chiles are stuffed with ground or shredded beef or cheese. In central Mexico anchos are stuffed with a mixture of vegetables—corn grains, squash, carrots, and squash blossoms among other vegetables. Mexico City offers everything; however, anchos stuffed with shrimp or a mix of seafood are popular and served cold. Xalapa, Veracruz, home of the jalapeños, has in its markets’ special piles of big ones selected for stuffing. Big chipotles are also selected in Xalapa for this noble purpose. In the Yucatan peninsula, xcatics are very popular stuffed with Gouda cheese or fried baby shark covered with kool sauce, a white sauce that reminds one of a bechamel, made of poultry stock, flour, whole olives and capers, and epazote—the only American ingredient. This is a sauce originally used for queso relleno, a Yucatecan specialty. As you can tell, traveling in Mexico could be a rich chile adventure. 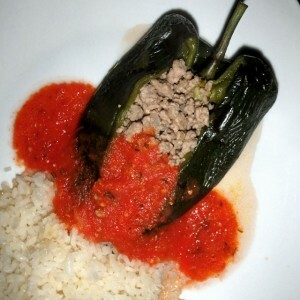 Always ask for their typical regional dishes and if you wish, state that you are interested in the local chiles rellenos specialty, there is always something to be discovered, you are not going to be disappointed. Now, while you make it there, here below are three good options for home cooking… Provecho!